This high quality compact and versatile iOS Lightning port microphone is much better than the built-in mic on Apple’s iOS equipment. Recordings are clear and crisp. Audio fidelity is very impressive at all sound levels. A turn knob on the side of the unit adjusts input volume. 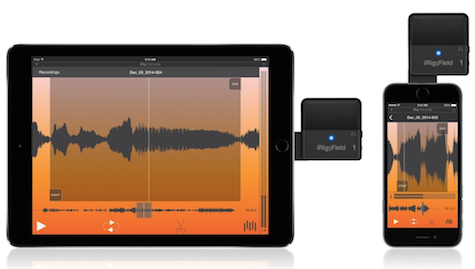 This microphone works with all Apple and third party iOS recording apps. Thick-edged iDevice cases may obstruct the Lightning tip’s insertion. 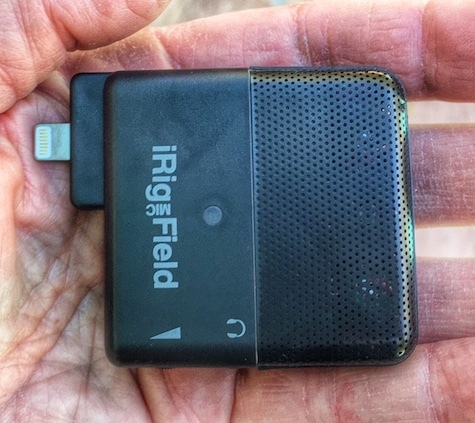 iRig Mic Field can be used in classrooms, offices, music venues, rehearsal studios, job interviews, oral history projects, medical appointments, training sessions, podcast recordings, outdoor locations, and anywhere you need live sound capture. It is small and light weight enough not to call attention to itself. An LED gain indicator provides visual confirmation of the input volume. Below are four live recordings made using this microphone. iRig Mic Field will be with me at all times. It forever changes the way I record live audio on my iOS gear. The price seems steep until you hear it deliver audio like no comparable microphone. Learn about the company’s recommended audio apps. See a promotional video featuring iRig Mic Field. Company photos of the mic in various situations. Additional helpful articles and photos are here and here.